If you can find a remotely credible source that credits Westboro Baptist Church with even a hundred members, you’re a more energetic or skilled researcher than I am. When Pastor Phelps describes his congregation as family, he’s not really stretching the truth. No doubt, it’s not hard to find sin in America (although we often differ on definitions: splitting infinitives? cheese with seafood?). Westboro protests at servicemen’s funerals, the Holocaust museum, and Catholic colleges–among other sites, not because they are the most sinful, but because they will be the most visible. Dahlia Lithwick offers an analysis of the court case at Slate. She says constitutional law on these matters is unambiguous (the first amendment protects hateful speech), and wonders why the Court took the case. She speculates the some of the justices wanted to condemn the protesters. So, in comments, Lukas asks whether disruption really works? Would you know about the Westboro church without it? Maryann Barakso wonders whether there is any long-lasting benefits for the crusaders against sin. Certainly, the Westboro campaigns probably don’t help the cause of a much larger number of people who advance a fundamentalist interpretation of the Bible. They’re not the people you want carrying your cause. Deana Rohlinger offers another answer: witnessing and facing opposition and confrontation is a testing by fire that solidifies the faith of the few, their identities as Westboro fundamentalists, and their commitment to the cause. Note that other marginal causes employ similar tactics. 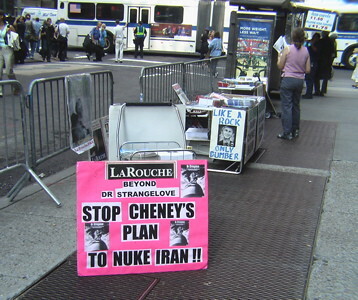 Here are a couple of examples from the acolytes of Lyndon Larouche. Such efforts aren’t about convincing people of the merits of your claim. Rather, it’s about getting attention through/and provoking confrontation. This entry was posted in Uncategorized and tagged Larouche, tactics, Westboro. Bookmark the permalink.